On November 9th, Bloomfield Development Corporation hosted a community meeting to review proposed new development at 4652 Friendship Avenue and Pearl Street. The developer, Walnut Capital, and their architects, Rothschild Doyno Collaborative, are proposing to build 6 new town homes fronting on Pearl Street and spanning from Rosina Way to Friendship Avenue. Much of the community discussion centered on the impacts the development would have on both parking and property values/rental rates in the neighborhood. 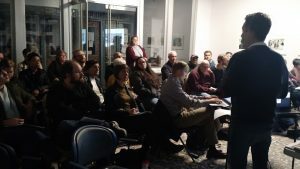 Among other questions, residents also expressed concerns about the density of the units, the loss of green space, and the height of the buildings themselves. Bloomfield Development Corporation will work with the developer and architects to try to address these concerns in advance of a second community meeting. Feel free to email us at info@bloomfieldnow.org or call at 412-681-8800 if you have any additional thoughts or questions that are not reflected in the notes. ← BDC Holiday Party: Dec. 4th at Station!